is both a fun, valuable hobby, as well as an amateur sport. At the fun end of memory, informal competitions take place in Brain Clubs and in other Mind Sports groups taking many different forms.At a competitive level, there are specific disciplines which were created in 1991 by the founders of the sport, Tony Buzan and Raymond Keene OBE, and which lay down a common competition framework that has enabled international competition to take place. It is based on the ten memory disciplines. Competitions that comply with the WMSC rules standards can be included in the World Rankings. At a World level, some disciplines like cards and number can have a one hour memorisation period and a two hour recall time. At a national level, memorization times can be reduced to five minutes, with a ten or fifteen minute recall time to suit the level of competitors taking part. Another factor in the choice of disciplines is the preparation of competition materials. Some disciplines, like Names and Faces, Binary Numbers etc take some time to produce the memorisation and recall papers. These types of discipline require experienced Arbiters and time for marking. The Mind Sport of Memory was founded in 1991 by the inventor of Mind Maps and expert on Mental Literacy, Tony Buzan and Chess Grand Master, Raymond Keene OBE. The Ten Disciplines which formed the basis of the first competition are largely unchanged today and have been adopted worldwide as the basis for competitive memory competitions. There are now competitors from 30 countries participating in the sport, all competing to become the next World Memory Champion. 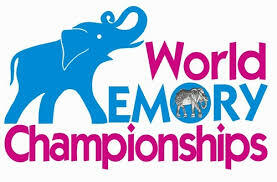 The sport is administered by the World Memory Sports Council which is the governing body for the sport. It compiles the World Rankings, is the custodian of the ten disciplines and ensures fair play worldwide through its Ethics Committee chaired by eight times World Memory Champion, Dominic O’Brien. Memory is a sport in which everyone can take part. None of the top competitors would claim to be born with a great memory. All of them have learned all the necessary techniques to develop their skills, and have practiced to a high level to get them to the top of the sport. You can do the same! Why not start today? Memory is one of the five “Learning Mind Sports” which are Speed Reading, IQ, Creativity, Mind Mapping, and Memory. All of them are competitive sports, and collectively they can help anyone to become better in their studies or in their work.